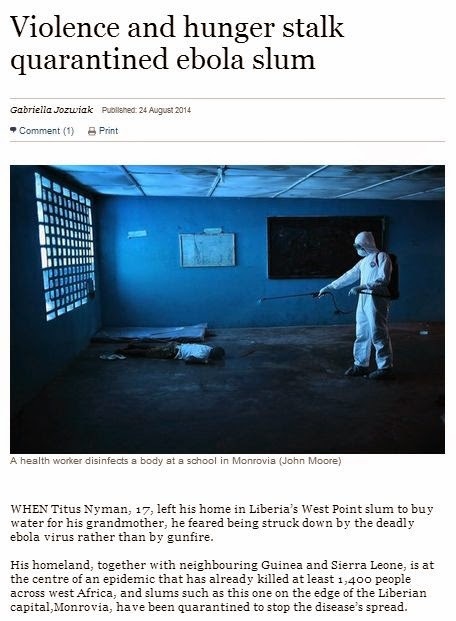 "WHEN Titus Nyman, 17, left his home in Liberia’s West Point slum to buy water for his grandmother, he feared being struck down by the deadly ebola virus rather than by gunfire. "His homeland, together with neighbouring Guinea and Sierra Leone, is at the centre of an epidemic that has already killed at least 1,400 people across west Africa, and slums such as this one on the edge of the Liberian capital, Monrovia, have been quarantined to stop the disease’s spread. "On Wednesday, however, an angry mob had gathered to protest against the government’s decision to isolate the community of about 75,000 people. As Titus passed the military blockade, security forces opened fire. He and two other boys were left bleeding on the ground..."
Read the full article on the Sunday Times website.